As provided by a metallurgical consultant, an understanding of the makeup and characteristics of the materials you work with can improve your bottom line. The study of metals (metallurgy) address material selection, failure analysis, heat treating, mechanical testing, non-destructive testing, metallography, and material characterization. 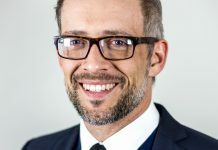 Small and large manufacturing companies can design and build better products by understanding and implementing these processes. 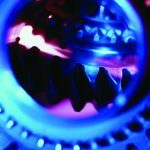 This paper will discuss manufacturing specifications, machining techniques, welding techniques, verifying product integrity, measuring performance, and determining end-of-life to enhance product performance and quality with the aim of improving profitability. Managers, engineers, and shop personnel will become enlightened regarding the benefits of interacting with registered metallurgists. Material performance is governed by 1) material selection, 2) material structure, and 3) material properties. Material selection could include: stainless steels, cast irons, aluminum alloys, and brasses. Material structure includes: microstructure, grain structure, phases, precipitates, and crystal structure. Material properties include: hardness, strength, ductility, fatigue, and corrosion. Performance includes: wear resistance, corrosion resistance, high temperature strength, notch sensitivity, and ductile-brittle-transition temperature. 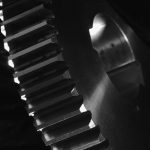 Most manufacturing companies try to minimize overhead costs by hiring a mechanical engineer as the company metallurgist. However, metallurgists have extensive training in the field of metals; many of whom have bachelor’s, master’s, and Ph.D. degrees in this focused area; they are truly specialists. 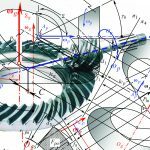 This contrasts with most mechanical engineers that have had only one to three materials courses in college at the undergraduate level. Interacting with a consultant in this specialized field would provide measurable cost benefits over the long term, which includes no employee benefit costs, minimal up-front costs, and long-term savings by preventing potential materials problems from occurring 1-4. The metallurgy consultant brings experience and a laboratory to the company at a small nominal cost, which the manufacturing company is not responsible for purchasing or maintaining. 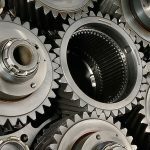 Several examples of benefits to manufacturing companies of all sizes will be presented and discussed; they include manufacturing specifications, installation instructions, fabrication techniques, measuring performance, and verifying product integrity. 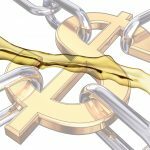 The goal of this paper is to increase awareness of manufacturing companies as to the benefits that may be overlooked as a result of increased focus on the profitability or “bottom line” that all companies face. 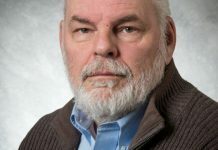 The author would welcome inquiries as to the type of assistance metallurgists can provide, but more importantly, companies should recognize that any registered metallurgist can provide the expertise needed. A registered metallurgist is an individual that is a professional engineer (PE) in the field of metallurgy. PE’s have met certain stringent criteria that include graduation from an accredited university, have several years of experience working with senior professionals, and have passed two eight-hour exams administered by the National Council of Examiners for Engineering and Surveying (NCEES) [www.ncees.org]. A PE license is different than having a Ph,D,; the PE license demonstrates practical learning and experience, whereas the Ph.D. shows academic ability (textbook learning and research experience). These two paths are quite different, but complementary (many Ph.D.s don’t obtain a PE license since they have gone to school for a long time and do not feel it is necessary to prove themselves to anyone else). A Columbaria reported that brass bolts used in two mausoleums were failing. Failure of these bolts resulted in crypt front marble slabs crashing to the ground. These bolts were manufactured from Cartridge Brass (C26000) and were beginning to fail after eight to 12 years of service. The Columbaria supplied several failed bolts along with several unused bolts for metallurgical evaluation; they requested that the cause of failure be determined. Metallurgical analysis was performed using macroscopic examination, microscopic examination, and scanning electron microscopy (SEM) techniques. 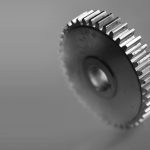 Mechanical characterization was conducted using tensile, Rockwell hardness, and microhardness testing equipment. Three unused bolts were tensile tested and the average ultimate tensile strength was 56.8 ksi. 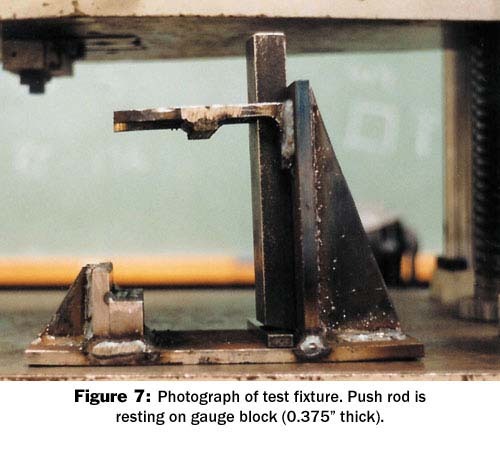 Tensile failures occurred in the threaded portion of the bolt and were not similar to the failure sites of the used bolts. The low tensile values were related to the fact that the bolt had threads that act as crack initiation sites, which lowers the performance of the material. The in-service (used) bolt failures did not occur due to overloading because there is no load on the bolts when properly installed. Several bolts were sectioned through the forged nut and evaluated metallographically. Figure 1 shows the macroscopic view of the sectioned bolt. There appeared to be a difference in grain structure related to the manufacturing process; heavier cold work and a corresponding higher strength appeared in the forged nut region. 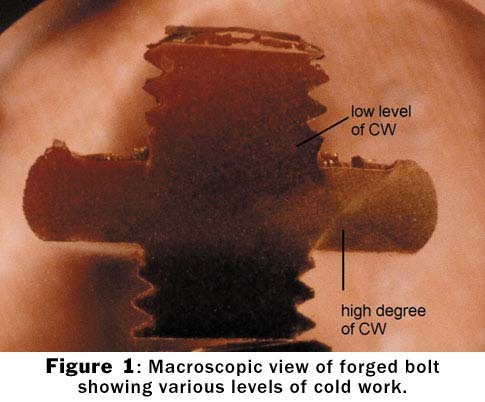 Figure 2 shows the macroscopic cross-section of a used bolt that was retrieved from the mausoleum prior to fracture (several bolts were retrieved at random and two bolts were severely cracked while the remaining bolts were free of cracks or defects). 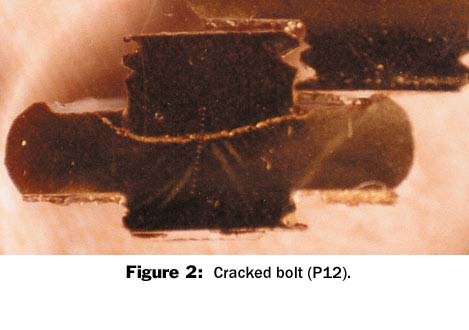 These cracks followed the same path as the bolts that failed in service (see Figure 3). The crack in Figure 2 followed the interface between the duplex grain structures. 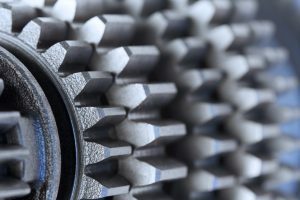 The grain structure in the threaded region of the bolt, that received less cold work than the forged nut region, possessed larger grain size and lower microhardness. The microhardness values for two bolts were tabulated in Table 1. It is readily apparent that the bolts possess duplex properties as a result of duplex microstructures. 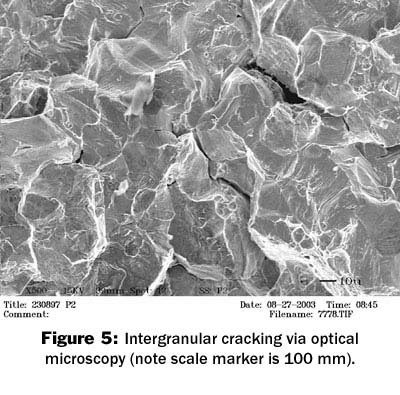 Intergranular cracking was readily apparent as shown in Figure 4 and Figure 5. 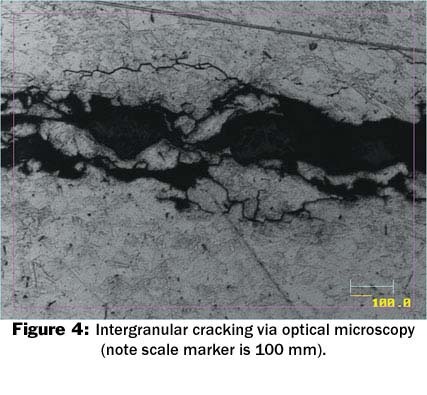 The main crack is intergranular and secondary intergranular cracking was present in numerous locations. 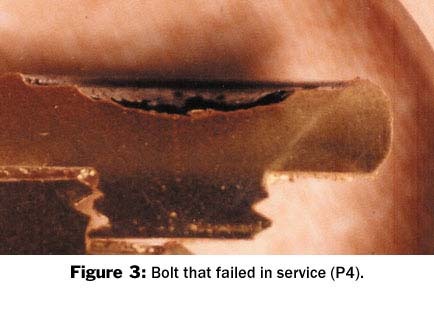 Stress corrosion cracking (SCC), also known as ìseasonal cracking,î occurred on the failed bolts. Three criteria are necessary for SCC to occur; presence of stress, corrosive environment, and a material susceptible to SCC. Brass is known to be susceptible to SCC when ammonia is present. Possible sources of ammonia include bacteria, fertilizer, and concrete. 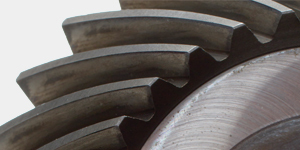 The stress is present due to residual stress from cold forging and/or overtorquing of the jam nut during assembly. All of the failed bolts came from areas of the mausoleum that were exposed to the environment: e.g., wind, rain, birds, and airborne fertilizer. • Stress corrosion cracking occurred in the subject bolts. 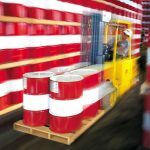 Three criteria are required for SCC; corrosive environment, stress, and susceptible material. Removing any one of these three criteria will prevent SCC from occurring. • Minimize residual stress (reduce torque values used in assembly at the mausoleum, perform stress relief anneal after cold forming of bolt). • Minimize presence of corrosive environment (rainwater leaching concrete chemicals and carrying fertilizer residue, bird droppings). • Change bolt material (consider low Zn brass, tough-pitch copper, oxygen-free high conductivity (OFHC) copper). An axle from a skid steer loader failed through the diameter at a step reduction in diameter (on the smaller diameter). 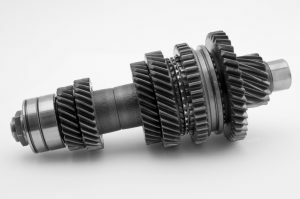 The operating history of the axle was unknown, but from 1045 cold rolled with no case hardening. The following tests were conducted: hardness, microhardness, microscopy and surface visual examination. Results of the visual examination using an optical comparator show several instances where the spline transition region did not exhibit a transition radius, but rather a chamfer. Chamfers can act as notches, which facilitate crack initiation. Visual examination of fracture surfaces shows that each fracture is associated with the transition to reduced diameter. The fracture surface exhibits numerous concentric rings, which indicates a number of fatigue cycles prior to the brittle overload condition. The outermost ring also shows indications of ratcheting. 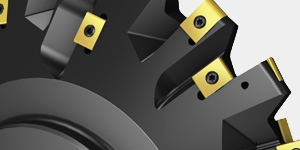 Ratcheting indicates multiple crack initiation sites, which means that the crack did not initiate at a single site, such as a notch or machining defect. The ratcheting and concentric rings were readily visible. The following conclusions and recommendations should be considered in the future to minimize re-occurrence of these problems. • Increase transition radius at reductions in diameter where possible. A radius of 1/8” is recommended. An increased transition radius will aid in reducing the notch effect, which act as stress concentration sites. Decreasing stress concentrations will increase the life of the part. 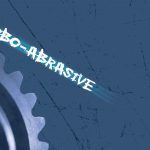 • Introduce surface compressive stresses that may prevent crack initiation (cracks initiate and grow only when tensile stresses are present). Shot peening is a common technique. • Select a different material that possesses higher fracture toughness than 1045 steel. In general, a higher alloy material possesses higher fracture toughness. However, tensile strength is not an indicator of fracture toughness performance. A manufacturing company was interested in characterizing their welds in track components as sketched in Figure 6. This loading is based on forces exerted during use. Two sample sets will be characterized by level of loading achieved on the side plate and performance of welds. A fixture was designed to hold the samples in a consistent position and facilitate ease of inserting the sample into the fixture as shown in Figure 7. 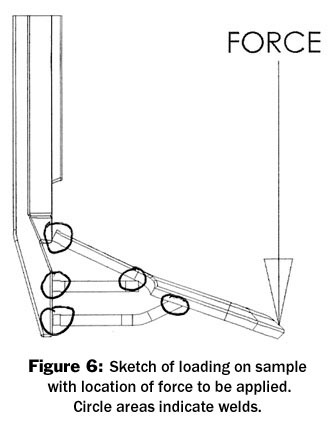 The tensile testing machine was used to apply the force as sketched in Figure 6. Table 2 lists the average loads sustained by each sample type and the amount of deflection of the side plate. The order of testing was A1, B1, A2, B2, etc. to minimize testing bias. The average load applied to the initial sample set (A) was 6470 pounds and these samples experienced almost 1” of deflection in the side plate. The average load applied to the second sample set (B) was 6786 pounds to achieve the same amount of side plate deflection. 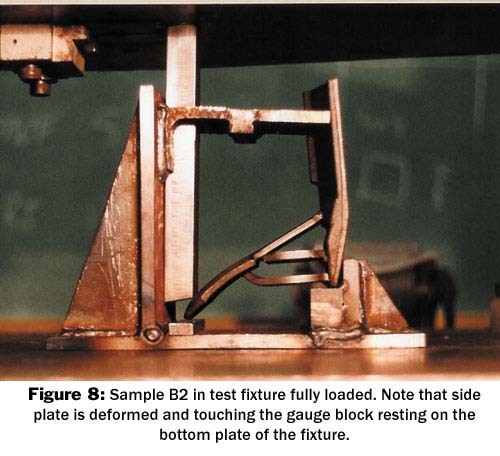 Each test was stopped after the side plate deformed approximately 1” and touched the gauge block positioned on the test fixture as shown in Figure 8 . Sample set B exhibited slightly different performance than sample set A: 1) sample set B required higher loading for the side plate to contact the gauge block, 2) sample set B exhibited more permanent plastic deformation. No cracking of welds occurred in either set. Based on this testing it was determined that weld performance was excellent. In no instance were any welds compromised; no cracking or degradation of the welds occurred. A company requested that precipitator wires, which were used as electrodes in the exhaust stack, be characterize to determine if replacement wires were required. 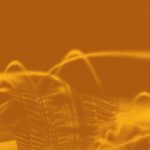 In particular, wire diameter, extent of corrosion and embrittlement require evaluation. They supplied five wires that are 31 feet long (two from boiler #1, two from boiler #2, and one unused). Five wires were received; unused (UN), field 1 Boiler 1 (F1B1), field 3 Boiler 1 (F3B1), field 1 Boiler 2 (F1B2), and field 3 Boiler 2 (F3B2). Samples were taken from the top and bottom of each wire with one sample location for the unused wire. Chemistry data was obtained for three wires, which included some areas of high corrosion levels. Microhardness and tensile testing were used to determine embrittlement behavior. Wire samples were mounted and polished after removing approximately one-half of the diameter. These metallographic mounts were used to determine the extent of corrosion penetration and to assess the microstructure. 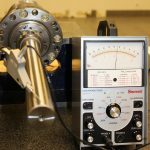 Scanning electron microscopy and energy dispersive x-ray (EDS) were used to characterize corrosion products and damage, as well as the wire diameter. The chemistry results indicated that the wires are 430 SS and 1050 and 4130 steels. 430 SS is a general purpose ferritic stainless steel, whereas 1050 and 4130 are general purpose high carbon steel wire and alloy steel (provides good mechanical properties via heat treatment). Wire diameters were measured with a caliper and evaluated using the SEM at 20X. All of the wires diameters ranged between 0.103 inches to 0.109 inches as shown in Table 3. Table 4 summarizes the microhardness results, level of ductility, failure loads, and tensile strength when characterized by hardness and tensile testing. Microhardness was conducted using Knoop indenter and converting to appropriate Rockwell scale. Microscopic inspection of indentations shows a large amount of ductility in the form of deformed metal. Microcracking was not observed in any sample. All five exhibited a similar amount of ductility and plastic deformation at failure. Tensile testing was performed all five wire samples. The failure load was a function of alloy, as shown in Table 4. Metallographic inspection of wires UN, F1B1, and F1B2 confirmed the tensile performance, as shown in Figures 9 through 11. The “unused” sample is comprised of martensite and ferrite (Figure 9). F1B1 contains ferrite plus carbides ( Figure 10). 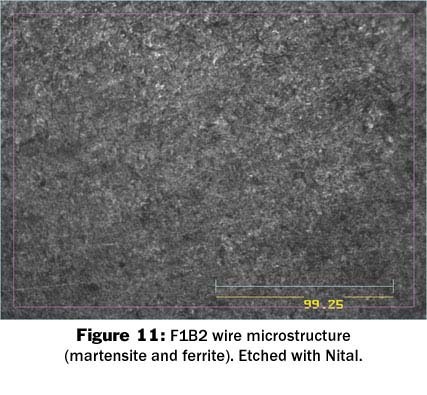 F1B2 exhibits martensite plus ferrite (Figure 11). The presence of martensite and ferrite indicate high temperature heat treatment, quench, and temper. Ferrite plus carbide is typical of annealing, which produces low tensile strength. The ultimate tensile strength (UTS) was determined in two ways: 1) hardness values can be converted to UTS and; 2) it can be determined from tensile tests by dividing the maximum load by the original cross sectional area. Both values are presented in Table 6 and show good agreement. The length of each wire was measured and compared to the unused wire, as shown in Table 4. The wires with less strength are longer than the wires with more strength (ductility normally decreases as strength increases). Other factors that can influence dimensional changes are time in service, loading in service, and temperature in service. 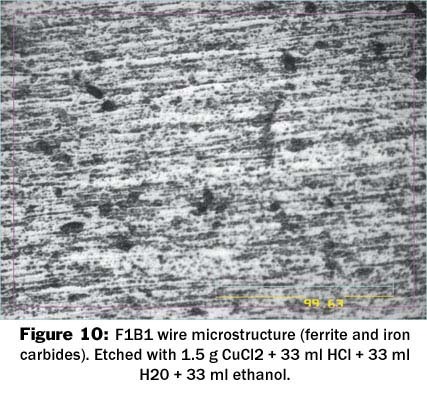 The level of corrosion penetration was assessed by wire diameter and by photomicrographs; very little metal loss has occurred due to corrosion. The quality of the surfaces is difficult to characterize due to the tremendous amount of oxide spalling off the wire during handling. An oxide nodule, iron oxide containing sodium and sulphur as determined by EDS, which could also be due to fingerprints. These wire samples do not exhibit severe embrittlement or stress corrosion cracking (SCC) as exemplified by metallographic inspection of the wire cross sections. 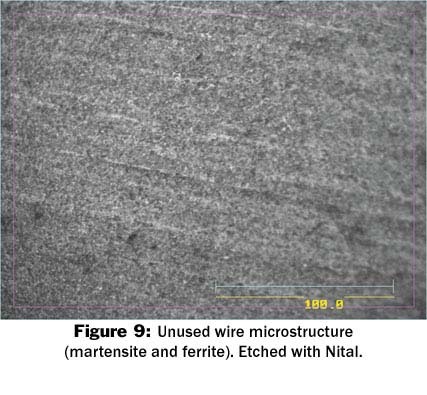 This analysis showed that the used wires exhibit some corrosion nodules consisting of iron-oxide containing sulphur and sodium. Wires from boiler #2 possess the highest level of corrosion. Chemical analysis reveals the wires to be 4130 (unused wire), 430 stainless steel (boiler #1), and 1050 (boiler #2). 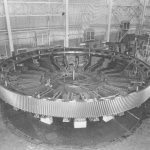 The wire diameters are consistent among all locations and are the same as the original wire; no significant thinning has occurred due to corrosion or use as a precipitator wire. Ductility is a function of composition and strength; no assessment of degradation can be made between the used wires and the unused wire due to the differences in alloy and wire processing steps. All these wires are capable of carrying a load of at least 950 pounds. Grain boundary embrittlement and SCC were not detected. The 410 SS is a good choice for corrosion resistance, strength, and toughness. A company supplied samples of plywood (marine grade seven ply) and composite material (2812 S) for characterization of mechanical properties. Testing included tensile, compression, three-point bend, and impact (toughness). These two types of materials were characterized via mechanical performance and documented via photography. Two different types of materials were supplied; three samples from each type material were tested. The ASTM standards 5-13 listed in the reference section were used as a guide in conducting the tests. All values reported in this document were the average of the three samples. Deflections at specified loads were measured at the middle of the length of each board. The flexural strength was defined as when the board failed catastrophically. The flexural modulus characterized the stiffness of the material. Tensile testing was conducted using standard techniques. The samples were 18” in length with the 2” gauge section cut to 1” width. The flat samples were strained at nominal rate of 0.2 in/min. Compression testing was performed on blocks that were 2” wide by 3” high. The height was selected to minimize bowing; it was twice the cross-sectional area. Toughness testing was conducted via Charpy impact machine. The samples were 10 mm by thickness, without a notch. The impact hammer passed through the plies (thickness) of each material. The average of each group of three samples is used in evaluating the performance of each type of material. The results of three-point bending are presented in Table 5 The orientation addresses the top of the board as fabricated. The maximum force is the load (pounds) at failure. The delta (Δ) values represent the deflection in inches at the load being applied. The nonlinear behavior of the material indicates that the flexural modulus should be measured at a low load 9: e.g., 10 pounds. It is readily apparent that the plywood has approximately 50 percent more strength than the composite board (3800 psi versus 2600 psi) and has twice the stiffness (flexural modulus) than the composite (144,000 versus 75,000). The results of tensile and compression testing are provided in Table 6. The tensile properties of both materials are similar with the plywood having a slightly higher tensile strength and lower yield strength (both of which are within 10 percent of the composite samples). The yield strengths represent a value when cracking within the sample is prevalent. Even though the plywood is slightly stronger, it possesses considerably more variability (up to three times the standard deviation as compared to the composite). 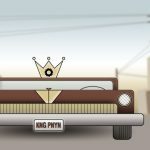 The plywood tends to fail via shear of each ply. While the composite tends to fail initially at its weakest link, the resin. After failure the composite is able to maintain some residual loading via the fiberglass, whereas the plywood falls rapidly to zero load. Upon comparing the poorest of each type material, the composite exhibits the higher tensile strength (4403 psi), but the wood continues to exhibit the higher compressive strength (2976 psi). The compressive property of the plywood is approximately 50 percent higher than the composite material and the variabilities are similar. The plywood tends to fail due to delamination and occasional shear of each ply, whereas the composite tends fail by shear and occasionally by delamination. Toughness is characterized by the amount of energy required to break a small sample in an impact situation: e.g., hammer strike. Table 7 summarizes the results. All the samples are similar in cross-section. Regardless of the orientation, the composite material is tougher than the plywood (absorbs more energy prior to failure). In general, the stronger materials exhibit lower toughness, whereas the weaker materials possess better toughness. • The marine grade seven ply plywood is superior to the SAS 2812 S composite material when comparing: tensile strength, compressive strength, bending strength, and bending stiffness. • This composite material is tougher than the wood. • The composite material exhibits less variability than the plywood. • Examining the minimum values for each test shows that the composite performs better for tensile strength. • Less variability provides a more consistent performing product. 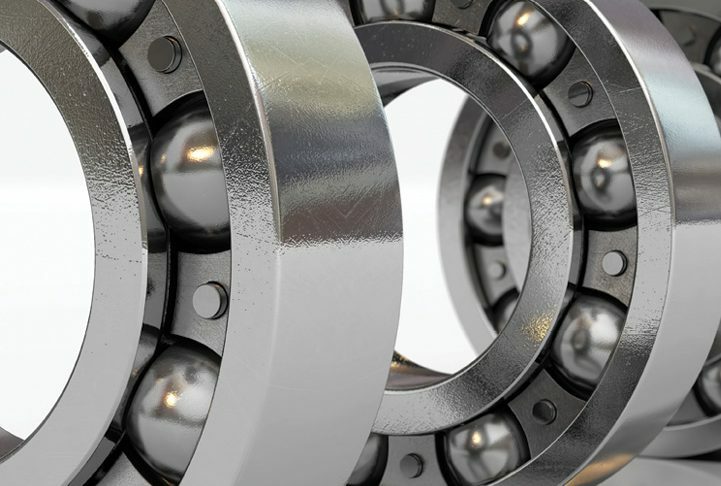 • Review design and manufacturing specifications for potential problems that would manifest themselves over a long period of time: i.e., corrosion and fatigue. • Review design drawings for potential problems: i.e., crack initiation sites. 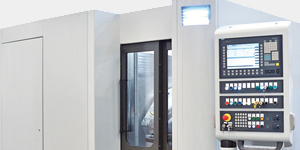 • Design test fixtures to replicate specific environments to characterize component performance. • Assess remaining life of component due to factors such as corrosion and embrittlement. • Characterize performance of multiple material options to assist in proper material selection. • Determine root cause of failure. Companies of all sizes can benefit by analysis of production equipment and manufactured products. Production equipment could be analyzed during routine scheduled maintenance to prevent unscheduled down time. 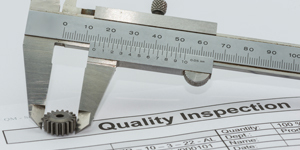 Manufactured products could be assessed during the design stage or after premature failure. 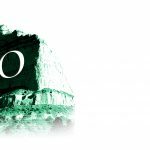 In all of these instances, companies would gain knowledge to minimize reoccurrence of the same problems. 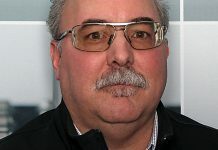 is president of Reitz Consulting, Ltd., which is based in Fargo, North Dakota. 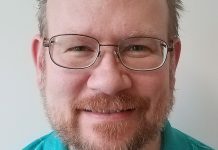 He can be reached at (701) 235-0859 or iwreitz@reitzmetallurgy.com. 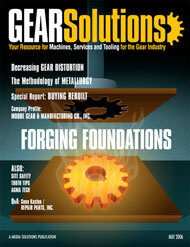 Go online to [www.reitzmetallurgy.com].